Get Your Nails Done, First things First! What did I just say??? Get your nails done??? Well ladies and gentlemen, yes, get your nails done. Look at all the 'pros' who have lovely nails, did you think they were just vain or had so much money that they were pampered princesses? Well, my dear readers, it is so much more than that. If you are working on a towel, delicate or other challenging fabric, a very small split or jag in your nail will find its way to damage your fabric, that is the rule! Murphy was an optimist! 1. Have your nails done. Nothing looks worse than snags from your nails and just a very small notch can make a big pull of the thread! 2. Review all color stops. Change colors on machine to accommodate or if on a single needle machine, line up each color you are going to use. If you are going to use a color more than once, make sure to use a marker such as a bobbin or piece of paper to indicate that multiple use. Consider changing the colors offered by the designer but remember that that professional is likely to have someone reviewing/creating each color for specific reasons. 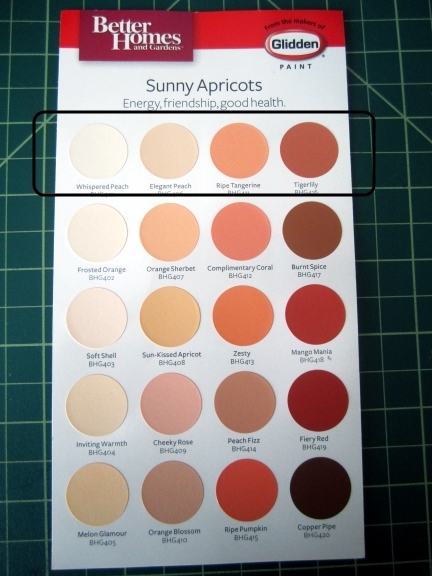 I am using color cards from my paint store to select my shades of the colors I want to use. While I cannot tell the Hues from the Saturations, I do know that using the color cards, the first photo, will give me colors that will go together. If I want to use the horizontal colors, I will select my threads from my stash! Or the verticle line and I know the colors will be pleasing to the eye. 3. 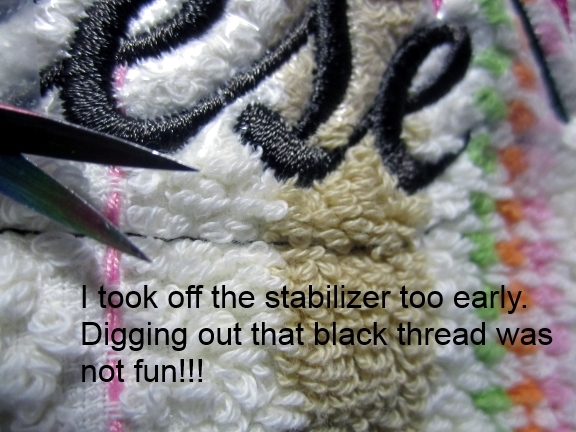 Do not use stabilizer scraps, these are more expensive than towels or any other fabric you are working with. I know we all try to save money but those scraps, unless they are large or work well in the project, can be a waste of fabric. 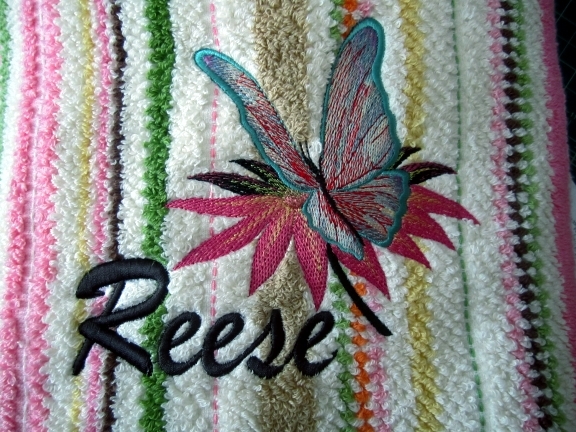 Even is the scrap is ALMOST the right side, with the 'pull' that occurs in embroidery, you will be headed for trouble. 4. Only hoop bottom stabilizer. When it comes to towels, napped fabric and other sensitive cloth, be sure to only hoop the bottom stabilizer. Hoop burn can be a deal breaker so don't take the chance. And, since towels tend to be heavy, use a heavy stabilizer as well. You may find, with your 'discovery sew' that more than one sheet of stabilizer may well be required. Frankly, over the years, I have understabilized many projects but, interestingly, NEVER over stabilized one. Sometimes I use a heat away and another time I may use a wash away. Whatever your preference, make sure it can hold the weight. And to go along with this point, make sure that any fabric hanging over the hoop is supported. I use a table or other sturdy veicle to place the weight on. If it is just 'hanging' make sure you won't find it 'slipping' because then the hoop can/will be moved, UGH, ask me how I know that. . . .
5. As noted above, create a baste outline that is larger than your design. Conversely, you can make it a lot smaller and when the totally filled design is done, the baste stitches are underneath the design. 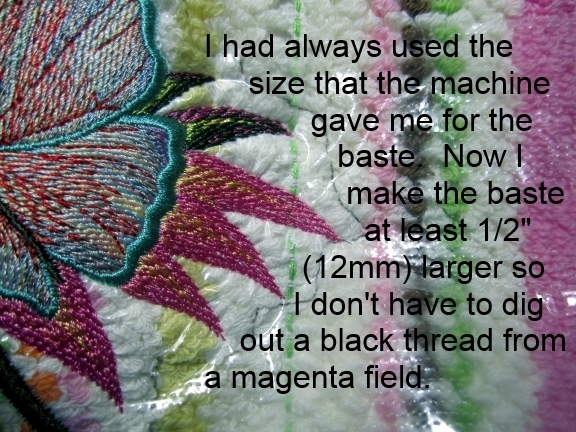 Another issue I have found is that the stitches is that the embroidery machine stitches tend to be on the small side. In the future, I am planning to use my regular sewing machine with which I can create as large a stitch as possible. Small stitches make removal difficult. 6. For my baste stitching, should I use the same color? I have gone back and forth on this issue and wonder what you personally do. I generally use a contrasting stitch but think it may be a better idea to use the same. What do you do? I would like to hear your ideas. For instance, there is such a thing as 'dissolving' thread which disintregrates when wet. In that case, I think using the top thread to crash and burn and the bobbin thread should be easy to remove. What do you think? 7. While a little difficult to find, if you can create a bobbin thread from the 60 weight spools in the same color as the top will make your design more interesting and able to look at from both sides. That won't work for names or words, but a floral pattern is dynamite done this way. 8. Place upper stabilizer on the filled hoop to complete the sewing package. 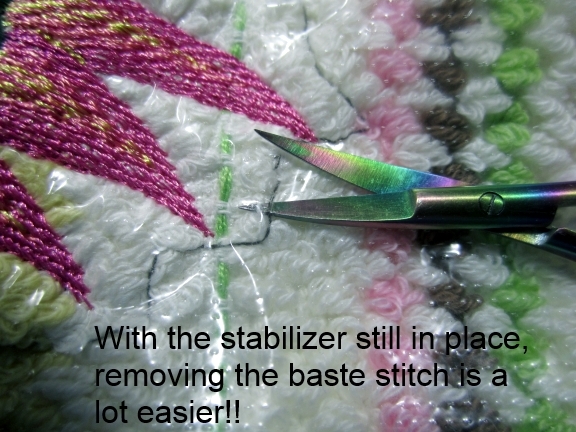 Whatever stabilizer you use, the upper stabilizer is to keep your stitches viewable and does not need to be as heavy as the lower stabilizer. I would still use the same stabilizer as the lower but just a single layer. Here is where you can use some of those scraps as long as they are a good size for your item. 9. At the point of placement of the top layer, I pin all three layers together as close to the edge as possible. Pinning inside a hoop is challenging but having them where a rapidly moving needle will land is dangerous. Pieces of broken pins or needles fly in any direction. 10. No matter what type of machine you are using, be sure that your pattern and basting stitches allow for the extra fabric to be away from the machine workings. That does often mean turning your design, but a little thinking ahead will make your fabric in a position to be well supported. 11. As I previously noted, I am planning to use the baste on my sewing machine rather than the embroidery machine. I will have my bottom stabilizer, fabric and top stabilizer appropriately in the hoop as I use the sewing machine. Keeping everything together helps everything make sure the registration will stay put and your design in its proper alignment. 12. Remove pins if desired. If the pins are placed correctly, removing them is not necessary. Keeping them in place is just another way to support this heavy fabric. 13. Run design. Geeze, I thought I would never get to this point! However, when I am doing a heavy towel, I do sit with it and watch it as it stitches its way to the finish. As a rule, I got tired of doing that a long time ago but with the issues that can/do happen you are in a position to stop the machine before much if any damage can occur. 14. At last, it is time for the finishing touches. Remove from hoop but leave on all the stabilizer both top and bottom. It is time to remove the baste stitches. This photo shows when I removed the stabilizer too quickly, it was a bear to clip just baste and not all those loops!!!! I usually prefer to remove the top stitches first but that is a personal preference. In either top of bottom case, the stabilizer is protecting the fabric from cuts. They may not show right now, but when used and washed, you can bet the cut thread will make its presence known. I enjoy removing the other side thread, that is a great way to be finishing up the project. 15. As always, remove as much stabilizer as possible from your project. Even if it is easy to wash away, you don't really need remnants of stabilizer in your plumbing. After all, the bits and pieces of everything that found its way into a pipe can be a big problem. Water soluble stabilizer can and will reconstitute itself. 16. Wash or iron as per the stabilizer that you used. 17. Enjoy your beautiful item. Take a photo or two. You will want to remember that you are doing professional and fantastic work. Friends often want to know what you are up to as well. When they see a terrific towel, you know what happens next! Do I think this is a lot of steps? You bet I do! Did I have problems if I missed a step? You bet I did! Towels are not really a good project for a newbie, but with a little attention to detail, it can be done. ps: I often look through my previous blogs for some of the things I like to remember. This time I went through the 2 blogs (one on my multiple machines and one on my multiple zillion designs) and was enjoying reading about your first machine, either sewing or embroidery. I invite you to see what others say about their 'machine stash' or their 'design stashes'. People speak of selling farm animals to get a sewing machine and other memorable stories. Hello CME: You are so right, that stabilizer has more options that a kid in a candy store. Someone once told me that making it thick and stringy, it can be used like a spiders web. That sounds a little far out for me. . . . . I like the idea of putting it in a tightly sealed container and adding water. I have done this with paint remnants. Once I had a totally dry water-based paint and added a few drops of water and it started to reconstitute. I added another few drops and soon I had perfect paint for touching up my hall wall. My Signature on my emails says "Learning and Sharing and Gifts" and I really mean that. CME, thanks for sharing this one with us. 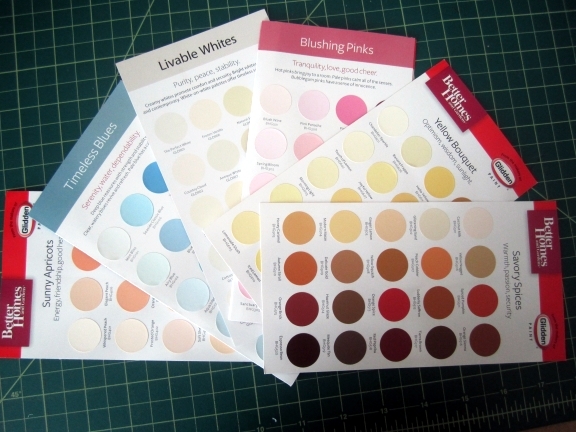 Pat instead of getting all these paint chips, putting either paper or bobbins on a color you are using more than once just PRINT out the color changes in a design. If you are changing colors do it on the printout. I would never use a heavy stablizer on a towel much less more than 1 sheet. I use either a washaway or a nylon mesh in the hoop and a topping. I NEVER hoop a towel. Why would you want to make a heavy item heavier?